Happy New Year everyone. I hope you had a wonderful holiday season. While much of the continental United States is enjoying a warmer than normal winter, Alaska has been bitterly cold with higher than average snowfall. It doesn’t make the news because most of you think it’s normal. For Alaska’s remote communities, their lives in winter depend on shipments that arrive before ice forms in the water preventing additional deliveries, except by air. For those living in the west coast city of Nome and nearby villages, this winter has been anything but normal. An intense winter storm battered Alaska’s west coast much earlier than expected, meaning the last fuel delivery could not be made. With temperatures in the winter as low as -60 (without wind chills) the loss of this fuel delivery is truly a life or death matter. What happened next was a series of discussions among local, state and federal governments to find a solution. The Sitnasuak Native Corporation signed a contract with Vitus Marine to have a Russian tanker deliver the fuel. What has happened since is an amazing lesson in international maritime law, federal maritime regulations and immense cooperation between private and federal entities. It was clear to most involved this was a critical situation. In fact, the tanker Renda began its mission (first heading to Korea) before all clearances were secured so it could arrive in Nome as early as possible. Today the fuel is on its way to Nome and is expected to arrive roughly eight weeks after the originally scheduled delivery was prevented and in time for residents to remain warm this winter. The Renda is headed to Nome escorted by USCG Cutter Healy, the Coast Guard’s only operating Arctic icebreaker. The cooperation of various government entities and the (relatively) fast cutting of red tape and regulations to let a foreign ship conduct this mission have been amazing to read. Many are likening this lifesaving mission to the 1925 Serum Run when diphtheria was raced to Nome via dogsleds. Those involved are credited with saving many lives in the area. Today’s Iditarod Trail Sled Dog Race is along roughly the same routes. What’s unique about today’s mission from a communication standpoint is the use of web-based tools to tell the story while the mission is unfolding. I have made this story as uncomplicated as I could but thought my readers would enjoy learning a little about winter in remote Alaska with a modern-day communications twist. PS – As I was getting ready to publish this, Caray published another update reporting the crew is celebrating Russian Christmas aboard the ship. So I shouldn’t be jealous that you have all that snow and I have none? Great post @mdbarber!! We at the NOAA Sea Ice Desk have been involved with this project since the beginning and it’s been amazing to see how all of the partners involved have worked so well together on this journey!! @Polar_Gal Lots of organizations have had to work together for this project. It really is very exciting. I’m not familiar with the Sea Ice Desk but your work must be fascinating. And you get to go to Nome soon to watch all this transpire. I am really jealous and look forward to living vicariously through you! This is really an incredible story, Mary. You’re right – normally we in the Lower 48 (as I know you like to call it!) wouldn’t hear of things like this. And we should. It’s far too easy to get wrapped up in our own little worlds. So when will they reach Nome? @Shonali I believe they are due in to Nome in three to four days. @Polar_Gal is headed out there on the press plane so she will know more accurately than I do. She just posted this really incredible photo on Twitter from the ice cams: http://icefloe.net/Aloftcon_Photos/albums/2012/20120106-2201.jpeg. Check it out! Wow! We really do take things for granted. This is a remarkable story of putting the good of the whole before the good of one. Thanks for sharing. @AbbieF I think we all tend to do that. Life in Alaska’s rural villages and towns is something few of us really understand. This story is great to explain it, and I thought with the tie to using social media it was a fun one for folks to follow as well. Glad you liked it. 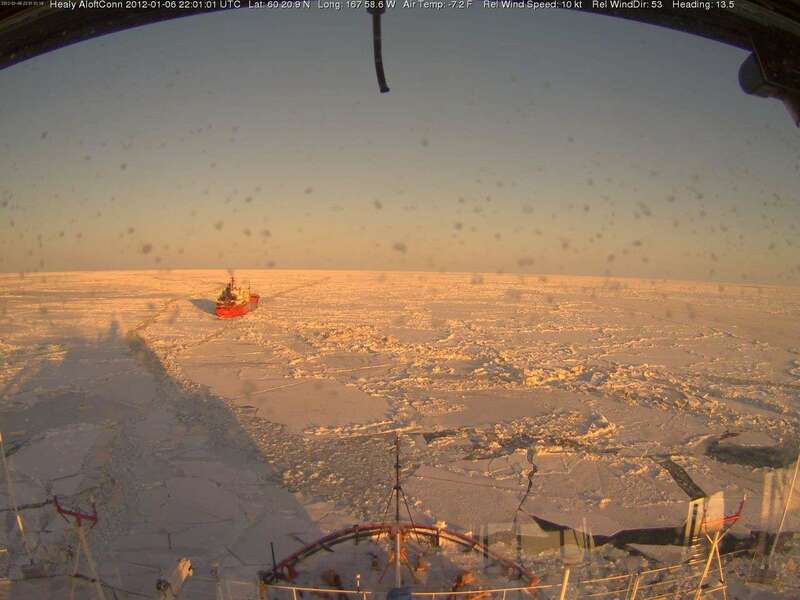 Here’s a link to the US Coast Guard Cutter Healy’s web cam so you can follow the rest of the trip: http://icefloe.net/Aloftcon_Photos/index.php?p=search&date=2012-01 and see what they are seeing. How interesting! I love that he’s tweeting his progress and keeping everyone up to date and apart of this journey. I hope you’re staying warm and that your making good productive use of those teenage boys for shoveling purposes! @rachaelseda It is such an interesting mission. There was a story on the front page of yesterday’s NY Times which was really great. Evidently international news outlets are now catching the story too. Hope they get the facts correct. Russia and Alaska have a long history of collaboration and working together. The boys are getting lots of time with the shovel this winter. My eldest will be glad to leave for college this weekend and get a break from it. They are forecasting 9-18/24 inches agan tonight! @mdbarber Oh my goodness, I don’t know how you handle all that snow! @rachaelseda It’s all part of living here but this winter has been amazing. We learned yesterday we broke a record for year to date. That makes me happy. If it’s going to be high, let’s at least break a record or reach a milestone.